This week the always awesome Ubuntu Developer Week starts! I am hugely excited about this week, and I can’t wait to see the many fantastic sessions that will be taking place. Connecting to Ubuntu Developer Week has never been easier, with Lernid. Installing Lernid is a piece of cake. There are packages available for Ubuntu 9.10 Karmic Koala and Ubuntu 10.04 Lucid Lynx. Alan Bell did a wonderful screencast showing how to install Lernid. You can see it by clicking here. Please note the screencast shows an older version (0.4) but the steps should be the same for the new Lernid 0.5 release. You can now load Lernid from Applications->Internet. First load Lernid by clicking Applications->Internet->Lernid. 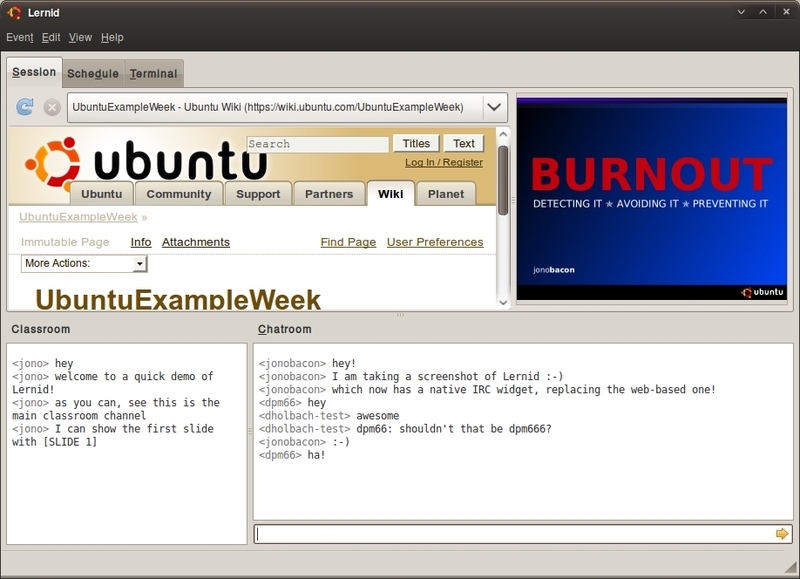 When Lernid starts, select Ubuntu Developer Week and enter a nickname and click Connect. You can then click on Schedule to see the list of events happening and the times (in your local timezone). The sessions will happen in the Classroom pane and you can discuss the session in the Chatroom pane. Couple of things to note about the screencast, firstly it was done on a live CD – you can run the live CD, install lernid in the live session and participate in the various learning events without Ubuntu being installed on the hard disk of the computer. Of course you will have to re-install lernid each time you do this, but you have that option. Secondly, this screencast ends on an error message caused by a bug that has now been fixed. I will update the screencast with the new version and add a commentary, hopefully in the next day or so. Hi I clicked on the link to the install video. Dead. I followed the instructions for installation and got an error message about no repository argument. This is my typical Ubuntu experience. I’ll keep trying to abandon Windows. yep.. also for me.. the link is dead… “You don’t have permission to access /~alanbell/lernidlive.ogv on this server.” to the screencast..
There’s got to be more to the Lernid install (i.e., missing requirement or config step). I installed, started Lernid, and the only section that has any content is the upper session. Classroom Chatroom, Schedule are all blank. Terminal works.